As the child of a university academic, I had the privilege of calling many of the great academics of my father's generation by the familiar appellation “uncle”. Although I was never formally a student of the University of Peradeniya, as a result of spending most of my childhood within its grounds I was also greatly influenced by its rarefied atmosphere. Ashley Halpe lived within walking distance of our University quarters, but I never ran into him as a result of the socio-intellectual circles in which I grew up. As I had no great inclination towards or talent for music, I also remained outside the sphere of influence of Aunty Bridget's music classes. It was Ashley Halpe who discovered me. Like many of my peers, I was brought up on a diet of Enid Blyton and other glorious escapist literature. Inspired by my reading, and the influence of my older sister, I had been writing, or attempting to write, fiction from the age of seven. By the time I was in Grade 2 at Trinity College, I had hand written a “full length” children's novel in the pages of a large exercise book. When Professor Halpe organised an islandwide creative writing competition in collaboration with the K. V. G. De Silva bookshop, I was ready to be found. As a young teenager, having discovered the worlds of Asimov, I had started writing science fiction. I submitted a short story in this genre and was delighted to be awarded fourth place. I suddenly discovered that there was a whole community of young writers out there. To my consternation I also realised that some of them were far more talented than I was. What happened next had a profound impact on my life. A few weeks after the prize giving I got a letter inviting me to participate in a 2-day residential workshop for young writers. I was also fortunate to have parents who were willing to take the risk of sending me to Colombo and to spend the night among strangers. I'm sure Ashley Halpe's involvement in this workshop played a big role in reassuring them about my safety. I walked through the doors of the Sri Lanka Foundation Institute, and became part of the Young Writers phenomenon of the 1990s. Most of the writers I met at this workshop were a few years older than me. The most mature among them were already writing serious fiction with essentially Sri Lankan themes. This too was strange to me, as I was still living in a fantasy universe lost somewhere amidst the imaginations of the likes of Enid Blyton and C.S. Lewis. I was also exposed to English poetry on Sri Lankan themes. It was a revelation to discover that JVP terrorism and the disappearance of Richard Soysa were legitimate topics for poetry and short stories. In discussing my work, Ashley Halpe asked me, “Why do you want to write about English or American children? Why don't you write about Sri Lankan people?” It had never occurred to me that I should write about our dirty, commonplace, war-torn, revolution prone, scandalous, at times ridiculous, and at time magical existence in Sri Lanka. Then there was Carl Muller. He came to our workshops, and spoke, and was regarded by the gentle, middle-class, pampered among us with horror, the way you would regard some horrible bristling snarling creature if it had crawled into your bedroom. Ashley Halpe and Carl Muller at times played a double act. Although worlds apart as personalities, the message they, and many other great writers conveyed to us was clear – don't write anything anybody has written about before; if writing isn't among the top three priorities in your life, then this business is not for you; and Carl Muller, mischievous rascal that he was, said, “You're not in a popularity contest. Write to shock. If people are outraged by what you write, then you have succeeded. Look at me.” We did; and learned, and were converted – some of us, that is. Others retained horror. Some of our parents wouldn't have let us within ten kilometres of Carl Muller. Ashley Halpe let him run rampage among our virgin sensibilities and dreary old literary conventions. The establishment would have turned us into lobotomised sycophants of literary traditions dead for five decades. A germ of revolution had been firmly planted among a group of highly talented, yet boring, respectable middle-class brats. I went from wanting to be Enid Blyton to wanting to be an intellectual terrorist. This was Ashley Halpe's doing, and even if he were to deny this charge, I suspect he would do so with a twinkle in his eye. The older writers in our group soon left for universities in the US, UK and Australia, which was a growing trend among elitist middle class families at the time. I was left with none of the participants of that first workshop, but a burning desire to associate with young writers like them. This is how the Young Writers Association was born. With the help of Ashley Halpe, I was able to discover a new group of young writers. We brought together some of the most brilliant literary minds of our generation, and created an atmosphere that was electric. The time I spent with the young writers (which group naturally included Ashley Halpe) included some of the most wonderful moments of my youth. Some of the friendships that started within this group are among my strongest, and will probably last my whole life. Ashley Halpe came among us, a child among children. We accepted him without a second thought, although he was more than four times our age. It did not seem strange at all that we thought of him as one of us. Perhaps this was his genius – his great humility that allowed him to avoid holding us in awe. He had the ability to infiltrate the ranks of an elite group of teenagers in the 1990s, a feat worthy of an espionage agent, and to set their minds on fire from within. More than a decade later, when I reflect on what he achieved with us, I recognise that he was no mere teacher of English literature; he was a revolutionary. We organised workshops and competitions on our own; we published collections of our work in our own literary magazine. Many of us ended up going to universities in other countries, a trend that was probably enhanced by the young writers phenomenon. Eventually many of us ended up in careers that were not academic or literary. Yet, deep and lasting influences had left their imprint on our minds and characters. Even now many of us possess the weapons we need to toss up our participation in the rat race, and re-enter a world of total literary escapism. Terrorist organisations train and infiltrate operatives called sleepers, perfectly respectable and law abiding persons who can be revived after years of residence in a sleepy community, to suddenly carry out daring attacks. We too are literary sleepers; there are among us those who posses the talent to write a groundbreaking Sri Lankan novel or a work of outstanding poetry. I have no doubt that this will happen. When it does, it is only fitting that Ashley Halpe's name should be mentioned. I have never sat in a formal class conducted by Ashley Halpe, yet I consider him one of my greatest teachers. As I was a meta-student of the University of Peradeniya, so I remain a meta-student of Ashley Halpe. Sometimes a single comment he makes is worth six months in a University course. It has been my privilege that a person so senior to me in years and literary achievement has considered me his friend. 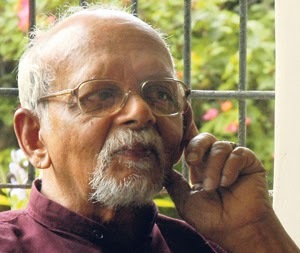 When Ashley Halpe left the University of Peradeniya after 42 years of service, he was not rewarded with a Presidential medal, or great accolades. Instead the oafs (I use this word with the authourity of one who has been a de facto member of the University of Peradeniya community all his life) of the University administration withheld his provident fund for many months on a petty pretext. This caused him and his family no small hardship. Professor Halpe endured this outrage also with the calm dignity with which he behaved at other times. Why do I bring up an incident such as this in paying tribute to him? This is the standard protocol of Sri Lankan bureaucracies in rewarding all our greatest citizens; it is an important incident in his life, and this is the true state of our universities. As Donne refers to in A Valediction: Forbidden Mourning, virtuous men pass quietly like the motion of planets, without tempests (of sighs or otherwise) or fanfare; So Ashley Halpe retired from the University of Peradeniya. The literary historian will look back on the body of writers and intellectuals who had the privilege to learn from, and to associate with him, and recognise his gentle, yet vast influence on all of them. There is a group of Sri Lankan writers who exist because of Ashley Halpe. I am no professional writer, and only a peripheral and minor member of this group. Yet the group itself is a significant force in our contemporary literature; perhaps one day we will be called the School of Ashley Halpe.